Much of Linda's focus is on monthly bookkeeping and financial statements along with payroll taxes, sales taxes and quarterly reports. She specializes in the preparation of trust returns and retirement returns along with corporate and partnership returns. Linda loves quilting, sewing, farming and is an avid reader. She spends much of her free time with her two younger children who are students at Rapid River School and both carry a 4.0 GPA. 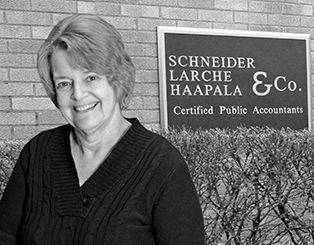 Linda and her husband have owned their home in Michigan for over 30 years, but did not move to the Escanaba area fulltime until 2006 when she joined Schneider, Larche & Haapala. Before that, Linda and her husband owned and operated their own machining company in Ohio for 20 years and moved the business to Wisconsin for 20 years. She has four children. Her only grandson joined their household in 2010 and is attending Bay College.